Jimmy Holiday never set out to make a career out of music. instead, he wanted to be a boxer, and got as far as fighting in the annual Golden Gloves competition. Then Jimmy started to get beat. That wasn’t in his plans. Realising he was never going to be more than a contender, Jimmy Holiday hung up his gloves aged thirteen. That presented a problem. What was he going to do with his life? Eleven years later, in 1958, Jimmy Holiday, who born on 24th July 1934, in Durant, Mississippi, was about to embark upon a career as a singer-songwriter. Jim Holiday and The Futuretones released their debut single Voice Of The Drums, on the Hollywood based Four Star label. Voice Of The Drums sunk without trace, and this proved an inauspicious start to Jimmy Holiday’s recording career. It would be another five years before Jimmy Holiday released his sophomore single. It wasn’t until 1962, that Jimmy Holiday returned with How Can I Forget, which was the first of two singles he released on Everest Records. How Can I Forget, penned by Ed Townsend, proved to be one of Everest Records’ most successful singles of 1963. At last, it looked as if Jimmy Holiday’s career was going places. With How Can I Forget proving a regional hit single, Jerry Wexler at Atlantic Records decided he wanted to license the single. Everest Records declined Jerry Wexler’s overtures. So, Jerry Wexler had Ben E. King cover How Can I Forget. This backfired on Atlantic Records. The Ben E. King cover of How Can I Forget stayed in the US R&B charts for one week. Meanwhile, Jimmy’s version reached number fifty-seven in the US Billboard 100 and number eight in the US R&B charts. This looked like being the start of the rise and rise of Jimmy Holiday at Everest Records. That proved not to be the case. None of the other singles Jimmy Holiday released on Everest Records failed to chart. So, Jimmy moved on, next stop K.T. Records. At K.T. Records, one of many short lived labels, Jimmy Holiday released just one single, Shield All Round. History repeated itself when Shield All Round failed commercially. This resulted in Jimmy moving on. Next stop for Jimmy Holiday was Tip Records, another indie label. He released just the one single, A Friend Of Mine. Still, commercial success eluded Jimmy. Like a musical nomad, he moved on again. This time, Jimmy called Diplomacy Records home for some time. Jimmy released just two singles, 1965s The New Breed and 1966s I Can’t Stand It. Both tracks proved popular locally. So much so, that Joe Biharis’ Kent Records’ licensed The New Breed and I Can’t Stand It, releasing them in 1967. By then, Jimmy Holiday was signed to the label where he enjoyed the best music of his career, Minit Records. Between 1966 and 1970, Jimmy Holiday was signed to Minit Records. It had been bought by Liberty Records in 1963, when they bought Imperial Records. A few months later, Minit closed its doors. Then in 1966, Minit arose, like a phoenix from the ashes, and became a dedicated soul label. Calvin Carter, formerly head of A&R at Vee Jay was brought in to take charge of A&R at Minit. His first signing was Jimmy Holiday in May 1966. At Minit, Jimmy Holiday would go on to release a string of singles and two albums. . His time career at Minit began in 1966, when Jimmy Holiday released his minute debut Baby I Love You. Accompanied by the studio band that Calvin Carter worked with at Vee Jay, Jimmy Holiday entered the studio to record Baby I Love You and the B-Side, You Won’t Go Away. Baby I Love You, a soul-baring ballad struck a nerve. On its release, it climbed up the US R&B charts, reaching number twenty-one. By then, Baby I Love You was a favourite of radio DJs. 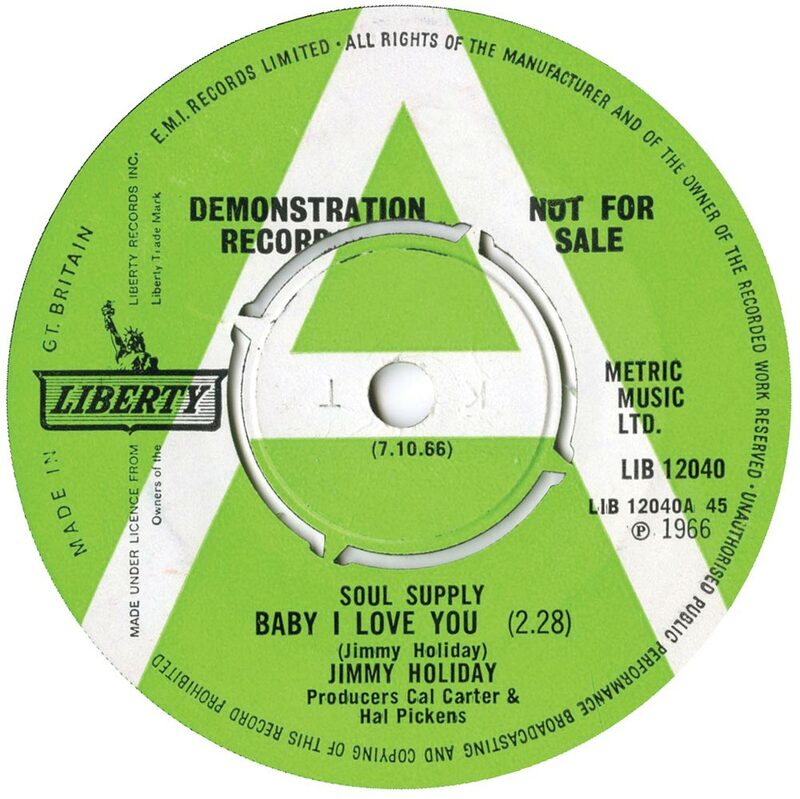 Following the success of Baby I Love You, the signing of Jimmy Holiday seemed like a masterstroke. Especially when Jimmy’s second single for Minit, The Turning Point, proved to be a minor soul classic. Even nearly fifty years later, The Turning Point, penned by Jimmy, is still guaranteed to tug at the heartstrings. Tucked away on the B-Side, was I’m Gonna Move To The City. It’s a mid tempo, hidden gem, that might well have been autobiographical. Despite the quality of The Turning Point and I’m Gonna Move To The City, the single failed to chart. For Jimmy this was disappointing. However, after the success of Baby I Love You, surely this was merely a blip? Still, Minit went ahead with the release of Jimmy’s debut album, Turning Point. Complete with a testimonial from Ray Charles, Turning Point hit the shops. However, Turning Point didn’t enjoy the same success as its namesake. For Jimmy this was a huge disappointment. Despite this, Jimmy’s thought turned to his third single. The song that was chosen, was In The Eyes Of My Girl, a beautiful, needy, heartfelt ballad. It was scheduled to be released as Jimmy’s third single of 1966, with Give Me Your Love on the flip side. What should’ve been Jimmy’s third single, oozed quality. It could’ve relaunched Jimmy’s faltering career, and showcased the two sides of Jimmy Holiday. Sadly, at the last minute, the release of In The Eyes Of My Girl was cancelled. For Jimmy, this was a crushing blow. 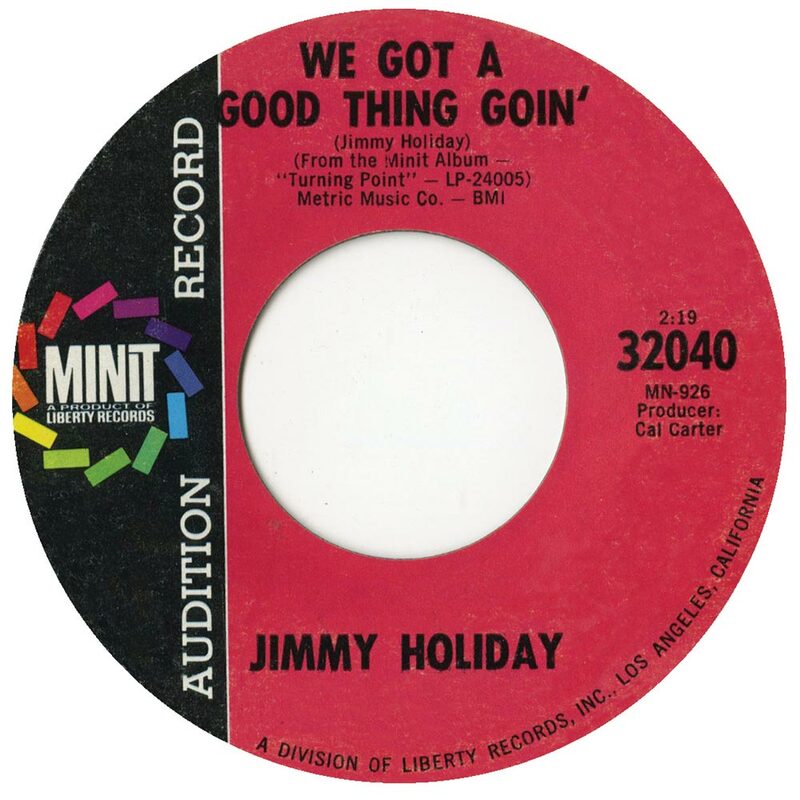 As 1966 became 1967, Jimmy Holiday returned with his long awaited third single, which was the ballad Everybody Needs Help. The B-Side was Give Me Your Love, which originally, was destined to be the flip side of In The Eyes Of My Girl. On its release, Give Me Your Love stalled at number thirty-six in the US R&B charts. Although this was disappointing, at least the single had charted. A small crumb of comfort was Jimmy’s popularity was increasing in Britain. On both sides of the Atlantic, Jimmy’s next single was a duet with Clydie King, Ready Willing And Able, an uptempo dancer. The flip side was We Got A Good Thing Goin’ a track from Jimmy’s debut album Turning Point. This mid tempo ballad, sees Jimmy and Clydie feed off each other, and transform the track. Sadly, Ready Willing And Able wasn’t a commercial success. However, Jimmy would write Clydie’s single I’ll Never Stop Loving You. Before that, Jimmy would’ve released his next single. This was I Wanna Help Hurry My Brothers Home. It’s another ballad, full of social comment. With the Vietnam War raging, Jimmy with anger, emotion and sadness filling his voice, sings “ I Wanna Help Hurry My Brothers Home.” It’s an impassioned plea. On the B-Side is the rueful ballad We Forgot About Love. It featured on Jimmy’s debut album Turning Point. Sadly, I Wanna Help Hurry My Brothers Home wasn’t a Turning Point in Jimmy’s career. The single disappeared without trace. For Jimmy, his career seemed to be at a crossroads. With 1967 drawing to a close, Jimmy recorded The Beauty Of A Girl In Love. It’s an impassioned, string driven ballad. Jimmy accompanied by backing vocalists combines emotion and power. However, despite the quality of The Beauty Of A Girl In Love, it failed to chart. Minit desperate for a hit single, decided something had to change. So, Jimmy was sent South, to work with Buddy Killen. They recorded the funky, soulful Spread Love at Chips Moman’s American Studios, in Memphis. This was very different from what people expected from Jimmy Holiday. The B-Side, however, was business as usual. It featured the ballad, We Got A Good Thing Goin’ from Jimmy’s debut album Turning Point. However, on the release of Spread Love, the decision to bring Buddy Killen onboard was vindicated. Spread Love reached number thirty-five in the US R&B charts. This looked like being the boost Jimmy’s career needed. Sadly, that wasn’t the case. Having just finished a concert in June 1968, Jimmy left the stage and collapsed. He was rushed to hospital, where it was discovered he required open heart surgery. Following the operation, Jimmy was told to rest. Stuck at home, Jimmy continued to write songs. This meant, when Jimmy’s health improved, he could head back down South and work with Buddy Killen again. That’s what Jimmy did. Having recovered from the open heart surgery, Minit sent Jimmy South again. With Buddy Killen, Jimmy recorded the string drenched, ballad I’m Gonna Use What I Got (To Get What I Need). For the flip side, Minit chose another track from Turning Point. This time, it was the ballad I Don’t Want to Hear It. These two tracks became Jimmy’s comeback single, I’m Gonna Use What I Got (To Get What I Need). Although it was a far better song than Spread Love, Jimmy’s comeback single flopped. Despite this setback, two other tracks recorded at American Studios, Memphis became Jimmy’s next single. For Jimmy’s next single, Baby Boy’s In Love was chosen. It’s an uptempo, driving slice of soul. Jimmy accompanied by a crack band of musicians and backing vocalists kicks loose. Here, we hear a very different side of Jimmy. The same can be said of the B-Side, a cover of If You’ve Got The Money, I’ve Got The Time. Originally recorded by Larry Frizzel, this hillbilly song heads in the direction of country soul and funk. There’s even a few yodels thrown in for good measure. This is Jimmy Holiday as he’s never been heard. However, still the commercial success that accompanied The Turning Point eluded Jimmy. For Jimmy, this was hugely frustrating. He certainly wasn’t lacking in talent. Jimmy Holiday was, after all, a talented singer-songwriter. However, for whatever reason, he wasn’t a consistent hit maker. So, he spent much of 1969 writing with Jackie DeShannon and her brother Randy Myers. One of their compositions, Yesterday Died became Jimmy’s next single for Minit. It sees Jimmy head in another direction. Nobody Died sees elements of soul, gospel and rock unite. It’s a welcome stylistic departure. The flip side Would You Like To Love Me, had been recorded a couple of years before, but never release. It’s another ballad, where Jimmy’s vocal veers between wistful to hopeful. These two very different sides to Jimmy Holiday became his next single. Yet again, however, commercial success eluded Jimmy. This proved to the beginning of end for Jimmy at Minit. With commercial succes proving elusive for Jimmy Holiday, it was only a matter of time before his career at Minit drew to a close. His swan-song was A Man Ain’t Nothin’ Without A Woman.It features an understated, gospel-tinged arrangement. A despairing Jimmy, accompanied by testifying backing vocalists ensures Jimmy’s time at Minit ends on a high. Especially, with I’m In Love With You on the B-Side. This should’ve been a recipe for success. Sadly, it wasn’t to be. Worse was to come. Minit closed its doors for the second time. Its final release was Jimmy’s swan-song A Man Ain’t Nothin’ Without A Woman. This was the end of the line for a once great label. Jimmy Holiday’s career at Minit spanned four years and two albums. He was Calvin Carter’s first signing when Minit reopened its doors in 1966. Having signed in May 1966, Jimmy Holiday released a string of singles and two albums. Sadly, success eluded him. Apart from a few minor hit singles, Jimmy’s time at Minit is a case of what might have been? That’s a great shame. Jimmy Holiday deserved better. After all, he was a talented singer-songwriter. In some quarters, Jimmy Holiday is regarded as an equal of Marvin Gaye, Otis Redding and Stevie Wonder. Sadly, Jimmy Holiday never enjoyed the same success as a singer. However, he forged a successful career as a songwriter. As a songwriter, Jimmy Holiday penned songs from everyone from Bobby Womack, Ray Charles, Ry Cooder, Jimmy Lewis, Jackie DeShannon, James Brown, Doris Duke, Z.Z. Hill and Little Milton. That’s not forgetting Al Perkins, Willie Hobbs, Jerry Lee Lewis and Velma Perkins. However, one of Jimmy Holiday’s best known songs is Put A Little Love In Your Heart. Originally recorded by Jackie DeShannon, Put A Little Love In Your Heart was then recorded by everyone from Al Green, Ella Fitzgerald, Dolly Parton and David Ruffin. Put A Little Love In Your Heart became Jimmy Holiday’s most successful song and changed his life. During the seventies, Jimmy enjoyed a successful career as a songwriter. His recording career took second place to songwriting. Then in the eighties, very little was heard of Jimmy Holiday. Ill health had taken its toll, and during the eighies, Jimmy Holiday decided now was the time to take things easy. Sadly, on 15th February 1987, Jimmy Holiday died of heart failure. He was only fifty three. That day, soul music lost one of its most talented singer-songwriters. Sadly, during the four years Jimmy Holiday spent at Minit, he never enjoyed the commercial success and critical acclaim his music deserved. Jimmy Holiday could’ve and should’ve become one of the biggest names in soul music. That wasn’t to be. Instead, Jimmy Holiday established a reputation as a talented songwriter. This sometimes, leads to Jimmy Holiday’s career as a singer being overlooked. Recently though, there’s been a resurgence in interest in Jimmy Holiday’s music, and belatedly the accidental singer-songwriter’s music is enjoying being discovered by a new audience. ← BOPPIN’ BY THE BAYOU-DRIVE-INS AND BABY DOLLS.